What better way to use up leftover ham than in warm biscuits. The perfect breakfast. 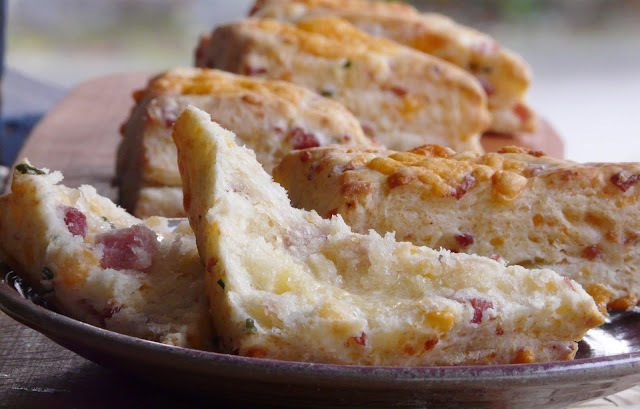 Biscuits filled with little cubes of ham, cheddar and chives. Uh oh, just had my husband on here and he is drooling over your site. I didn't think I would get my computer back. Savoury, homemade and just beautiful! Served warm? Divine! I would like one of those right now...they are gorgeous Ann! I would like to make these w/ cheese, would you say about 1 cup? Biscuit bountiful! These are gorgeous. I was just looking over at tastspotting and I thought those biscuits looked familiar. Sure enough they brought me back here. I can't wait to see what's cooking for dinner tonight. I thank you all for your comments. 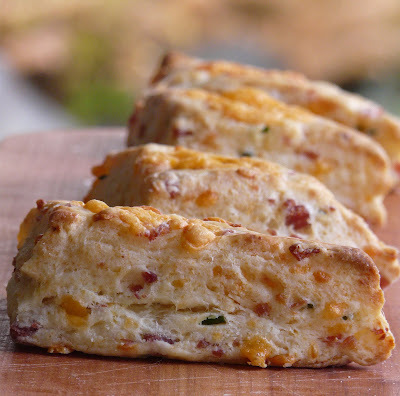 Lorie, These biscuits are so easy you should make your DH some for breakfast. Stacey, I never measure, but I'd guess that I used somewhere around 3/4 cup of grated cheddar. I grated it on the box grater so it was coarse not fine. Dana, Moe heard me tell Matt about your coddled eggs. I guess they will be on the breakfast menu around here one morning soon. Beautiful biscuits! My husband would flip over these! Oh, yay, my lucky day. I have a little leftover ham and some cheese in the fridge. These biscuits look heavenly and I'm making them for lunch to go with a nice bowl of soup. I am hopeless at making biscuits. I am going to try the box grater idea. It sounds like a great idea. These look delicious and I can only imagine that combination of smells. Just made these biscuits with a little crunchy bottom too - wonderful! Thanks for all the tips on making these biscuits. I am going to make some tomorrow.